A solar eclipse will block out the sun next week. While eclipses themselves aren't entirely uncommon, the Total Solar Eclipse (the one heading our way Monday) is very rare. Unfortunately, eclipse insurance doesn't exist, but that doesn't mean you can't protect yourself. Below is a guide to help you prepare for this unique phenomenon. Essentially, an eclipse is an astrological event where the moon will rotate in between the sun and the Earth. In this instance, people around the world will be experiencing a solar eclipse, which happens during the day. occur in January 2018, but isn't considered as too big of a deal. It sure makes for a pretty picture (see image to the left). Does Total Solar Eclipse mean the entire world will be surrounded by darkness? No, not at all. In this case, "Total" simply means that the sun will be completed blacked out in at least one location. When was the last Total Solar Eclipse? The last solar eclipse of this variety to have any impact on the United State occurred on July 11, 1991 and was only visible to resident of Hawaii. Even for those individuals that made the trip to Hawaii, the experience can only be described as lacking. The weather is Hawaii was uncooperative as there was heavy cloud cover, which reduced the impact of the event. When will Floridians see the Eclipse? If you reside in Florida, you will start to see the moon move in front of the sun around 1:15 p.m. The moon will continue to hang around until a little after 4 p.m. Unlike other parts of the United States, Florida will not experience the full effect from the eclipse, meaning Floridians will see a Partial Solar Eclipse. 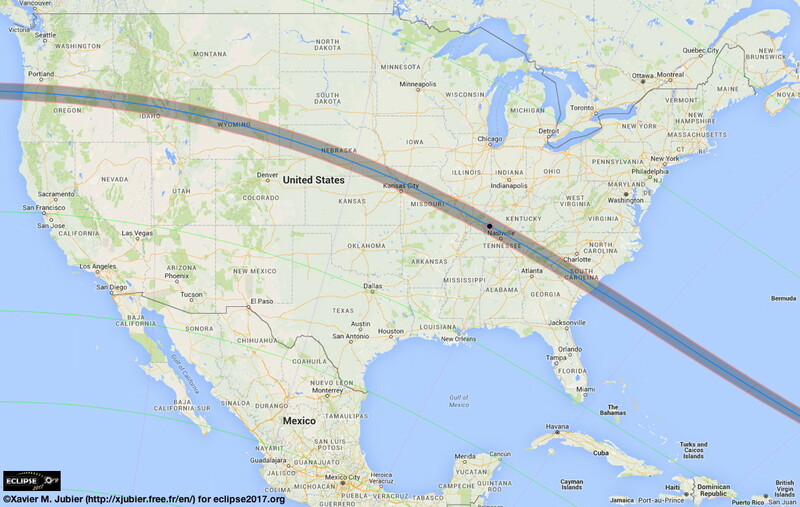 The following map shows how the eclipse will move across the country. Whichever areas are in the gray band, will experience the full effect of the solar eclipse. This is a very exciting, possibly a once in a lifetime opportunity. However, it's very important that you don't look at the sun during the eclipse. The full eclipse will only last a couple of minutes at most and the quick transition from dark to light can cause significant damage to your eyes.